This week many parts of the country saw record snowfalls. 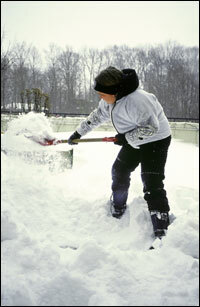 The days of shoveling have seemingly stretched into years. Snow is piling up everywhere, making snow removal even more difficult. Investment in a radiant heated snow melting system is smart. While electric snowmelt systems are fully automated and maintenance free, you can still do things to keep it operating at peak efficiency. If you do have an old system that is struggling to keep your driveway clear, you may only need a sensor update. You don’t have to wait until spring, or invest big bucks to tear up your entire driveway to fix the problem. Warmzone has a complete line of proven products, including WS-2 aerial-mount snow melting sensors that make repairing your existing electric or hydronic heated driveway a snap. Each unit has four mounting tabs that can be used to mount the sensor to a post, elevating it above the highest level of expected snow fall. Weighing in at just two pounds, they can be easily secured and supported on a variety of surfaces. There are a number of minimally invasive techniques for adding the WZ-2 aerial sensor to your existing snow melting system, regardless of the conditions outside. For convenience, the unit has pre-set all operational switches and set points; however, for further customization, users can access all electronics by simply removing the four screws of the front cover plate. Aerial-mount snow sensors are an integral part of any snow melting system, so the quality of your system components is critical. When sensors read changes in moisture and temperature indicating that snow is on the way, they trigger the system controller to activate your heated driveway as the first snowflake falls. They are the brain of your heated driveway and maximize efficiency. 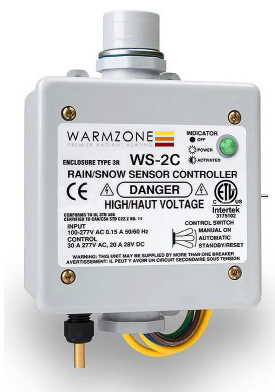 WS-2 snow sensors feature an adjustable “Delay Off” cycle. “Delay off” refers to drying cycle. This cycle restarts and operates whenever snow is detected, then continues for a short “delay off” period once the precipitation has stopped to dry the heated surface. This intuitive drying cycle enhances safety by reducing the chance of moisture refreezing into ice. For further efficiency and convenience, these sensors are also “smart system” ready, offering a number of remote features so you can control your heated driveway system from remote locations. For instance, the optional CS-1 cable and the snow sensor are easily connected into compatible Warmzone smart systems, giving you the ability to turn your radiant heated driveway on and off via your telephone. You can also control and monitor your driveway snow melting system from inside your home by adding Warmzone’s system-specific remote control panel. The panel provides basic DE-ICE ON status for deicing, as well as MANUAL ON, AUTOMATIC and STANDBY control capabilities. Even though the system is fully automated, it’s nice to have access to manual control as well. If you’re looking to update your snow melting system in time for the next storm, take heart. Warmzone WS-2 aerial-mounted sensors can be installed quickly so your driveway snow melting system is up and running for the next big storm. Call 888.488.9276 or visit Warmzone.com for more details. One of the many effective roof heating options available from Warmzone is the RoofHeat Panel roof deicing system. RoofHeat Panels feature self-regulating heat cable that is placed in the grooves of aluminum panels for maximum heat transfer. Because of the conductive properties of the aluminum panel, this roof deicing system is one of the most effective and efficient roof heating systems available. In the past, many homeowners “zig zagged” heat cable along the eaves of their roofs prevent ice dams from forming, but this method required much cable and not all the snow and ice would be melted at the roof’s edge. With the RoofHeat Panel system (Product Specsheet PDF), the heat cable is installed in special grooves within the aluminum panels to transfer heat quickly and evenly. Panels warm a larger surface area while using less cable, so not only is all the snow and ice melted at the roof’s edge, but there is less energy consumption as well. The system has proven to be more environmentally friendly, while keeping operation costs at a minimum. The attractive panels are powder-coated with a durable finish, and are available in a variety of colors (PDF) to choose from. RoofHeat panels are also available in several widths so you can choose how much of your roof edges to heat. Panels are available in 8, 12, and 18-inch widths and are interlocking, so you can truly customize your roof heating system as you see fit. Warmzone also offers RoofHeat valley heating panels that feature a 3-inch extruded aluminum panel. The roof valley panels may be the best roof valley heating solution on the market today. The heated panels provide a remarkably effective, and efficient means of melting snow and ice to protect your roof. The roof heating system typically melts snow on each side of the panel to create a significant clearing for runoff to eliminate buildup resulting in destructive ice dams. This industry leading roof heating system also features a lifetime manufacturer warranty! And don’t forget that Warmzone is known as the industry leader when it comes to customer service. Warmzone custom designs each system, and includes personal installation support services. We work with you throughout the installation process to ensure that your system is installed correctly and performing as expected. Call Warmzone today at 888.488.9276 to learn more about the custom roof deicing options available to you. Radiant Heat Product Manuals, Videos, Guides, Illustrations and more. Warmzone was recently named “VENDOR OF THE YEAR” by the National Association of Custom Home Builders. Digging out from the heavy snow in Aurora, Colorado each winter was a labor-intensive task that had worn Bob down over the years. Despite the rigors of this annual chore, Bob shoveled and salted his walks and driveway faithfully to keep them clear of snow throughout the cold season. But the repeated shoveling had left its mark on his aching back, and the salt had left its mark on the grass that bordered his driveway and sidewalks. After Bob broke his shovel during a late season storm last year, he started to rethink his winter ritual. He finished clearing the walks as best he could with the hapless shovel and headed to the warmth of his home. He kicked the snow off his boots, stepped into the entryway and hung his coat on a hook. “I’m so tired of shoveling snow,” he muttered to himself. “I gotta see about installing a heated driveway.” Bob and his wife were in the process of building a home in Golden, just west of Denver, and planned on moving within a year. Now was an ideal time to learn more about radiant heated snow melting systems. He pulled the cap off his head and expelled a heavy breath from his exhausted body and collapsed into the chair by his computer. “It doesn’t make sense,” he thought, “to build a dream home without having a snow melting system installed.” He leaned forward and grabbed the mouse to begin his search for a radiant heat provider. Meanwhile, over 800 miles away in Cottage Grove, Minnesota, Fred was experiencing the same frustrations, and drawing the same conclusion. As a homeowner he was tired of spending time and money shoveling snow and buying salt every year. Something needed to change. Tossing the final scoop of snow aside, Fred rested the shovel on his shoulder and conceded, “I’m getting too old for this.” He’d already cleared the driveway once earlier in the day and was feeling the effects of the workout. He flung the shovel into a corner of the garage and burst into the house with a frustrated groan. “What’s wrong?” his startled wife asked as he threw the door closed behind him. Fred typed “driveway heating” into the search box and clicked on one of the results. The website promised top-of-the-line snow melting systems, so Fred immediately began punching the numbers on his cell phone. The salesperson promised Fred the best system his money could buy, and that installing it in his asphalt driveway wouldn’t be a problem. This was music to Fred’s ears. After sending the company the dimensions of his driveway, Fred received an estimate and agreed to move forward. He was assured by the salesman that the heat cable was “top-notch” and the system would be easy to install. “Next winter,” the salesman assured, “you’ll be looking out over your clear, snow-free driveway as you’re sippin’ hot coffee in the morning.” And with that being said, Fred made the purchase. Back in Colorado, Bob had called several radiant heat providers before narrowing his choice down to two companies. After speaking to representatives at each business, it was clear to Bob that Warmzone would be the best choice. Warmzone carefully considered all the aspects of Bob’s snow melting needs (including his location, medium, altitude, available power, etc.) to ensure that his heated driveway would perform as expected. Having learned that a heated driveway is only as good as its installation, Bob was focused on working with experienced professionals who would stay with him throughout the entire installation process. Warmzone listened to Bob and then evaluated all his snowmelt needs to ensure that the right products and design were determined. Bob also learned that Warmzone offered online installation training for installers and personal installation support. Knowing that Warmzone was truly committed to providing unmatched customer service helped to put Bob’s mind at ease. It was apparent that Warmzone had the expertise, resources and commitment to do the job right. With Warmzone, Bob received a free quote, and upon his request, a free design / layout of his custom system. The layout contained all the power requirements, proper load calculations, breaker sizes, number of breakers, and technical specs up front, making the job for the installer much easier. All of Bob’s concerns were resolved prior to any installation taking place. The system was delivered on time and Warmzone’s installation support team provided training for Bob’s installer. And when the electrician called Warmzone with a question, just to be certain during the install, an expert was immediately available and stayed on the line for as long as needed. Because snow melting systems are relatively easy to install, most providers don’t offer installation training or house a dedicated support staff for installers. But Warmzone’s professional training services and installation support staff – in addition to its vast selection of proven products – differentiate Warmzone from other radiant heat providers. 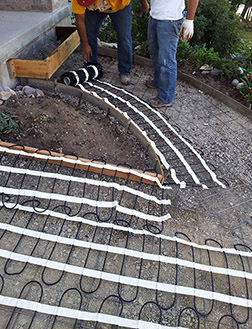 Understanding that a snowmelt system is only as good as its installation is why Warmzone is committed to providing the best installation support in the business. Bob and Fred share tales of two drastically different experiences with radiant heat. With a heated driveway, Bob could enjoy the best of times during the worst of times. Now he’s even working with Warmzone to install heated floors in his new home. But poor Fred; his original investment has almost doubled, and his system is still not working the way it should. “Oh, if I could do things over,” he grumbled. ♦ Bob consulted freely with Warmzone and learned a great deal by talking with the experienced rep and reading the wealth of information on Warmzone’s website – prior to receiving a free quote. Fred only learned the basics of the system he purchased, but learned nothing about the specifics of radiant heating systems. ♦ Bob had a wide selection of custom options (including electric and hydronic) to choose from. Fred was “sold” a “one-size-fits-all” snowmelt system. ♦ Bob requested and received a professional AutoCAD design of his heated driveway at no extra charge. Installation manuals and product documentation were also provided. Fred received general instructions on how to install his system. ♦ Bob’s installer received professional installation training from Warmzone. Fred was told that most contractors could install the system. ♦ Bob’s electrician received personal installation support from a radiant heat expert at Warmzone. Fred’s installer was left on his own to figure out the layout and installation. He discovered that Fred didn’t have enough power and that the heat cable was not ideally rated for the driveway.